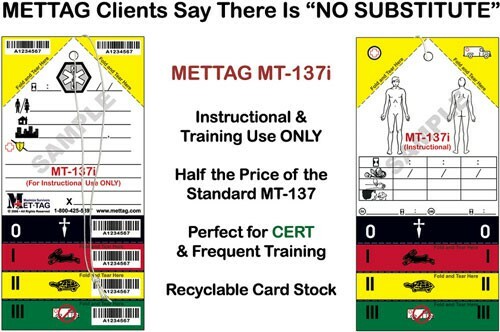 The recognized standard in triage tags is the Mettag-137. The MT-137 provides first responders and rescuer personnel with the standard features needed to enable prompt and accurate assessment of a Mass Casualty Incident (MCI) victim’s injuries and easily record the data during the triage process. Many emergency groups used the MT-137 extensively for training and actual Mass Casualty Incidents (MCI). These include such agencies as the U.S..Military branches, fire fighers, EMTs. Also many federal, state and local response agencies utilize the MT-137. These include the Department of Defense, Department of corrections, state and local Emergency Management agencies and Operations Centers, just to name a couple. During a Mass Casualty Incident (MCI), multiple victims with various degrees of injury severity, emergency personal must be able to quickly and easily determine the severity of each victim’s injury and priority status. Using the MET-137, emergency personnel can save precious seconds to indicate which victims require higher priority. For over 30 years the MT-137 has been tested and proven to be the ideal tool for this very purpose. The MT-137 is built to be durable with a water resistant high-density damage resistant synthetic material. Using a special thermal printing process allows the use in the most adverse and demanding environments. Every Medical Emergency Triage Tag has a 30-inch elastic band used for attaching the tag to the victim’s body. Typically the tag is placed around the neck or any other available limb. Using a unique sequential barcode serial number, victims are able to be tracked along with their belongings through the various stats of the triage and treatment processes. The serial numbers are conveniently located on both the top right and top left diagonal tear-offs, as well as on the lower color coded tear-offs. Thanks to the utilization of standard graphic symbols and a four-color tear-off triaging system. The MT-137 is truly a universal tool in that it presents no language or literacy barriers. Those who use any METTAG products in day-to-day emergencies will quickly become familiar with these standardized symbols. This allows faster and more effective victim triaging in the even of an actual MCI or other emergency will become second nature. Minimal training or hands-on experience is needed to be used by anyone in the field. 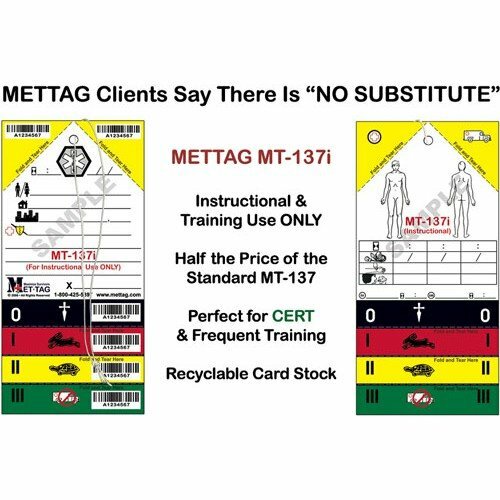 When it comes to a high quality, reliable and easy to use field triage tag for use by first responders to mass casualty incidents, or by officers participating in disaster drills and other response training exercises, then the MT-137 is exactly the tool that you need. Also available: MT-137i used for instructional and training only. Training tags are not water resistant.